In Britain, unlike many other countries, Trotskyism has been a significant force on the revolutionary left. As Big Flame aimed to help develop a current in this political space, it is not surprising to find it devoting its attention to Trotskyism. 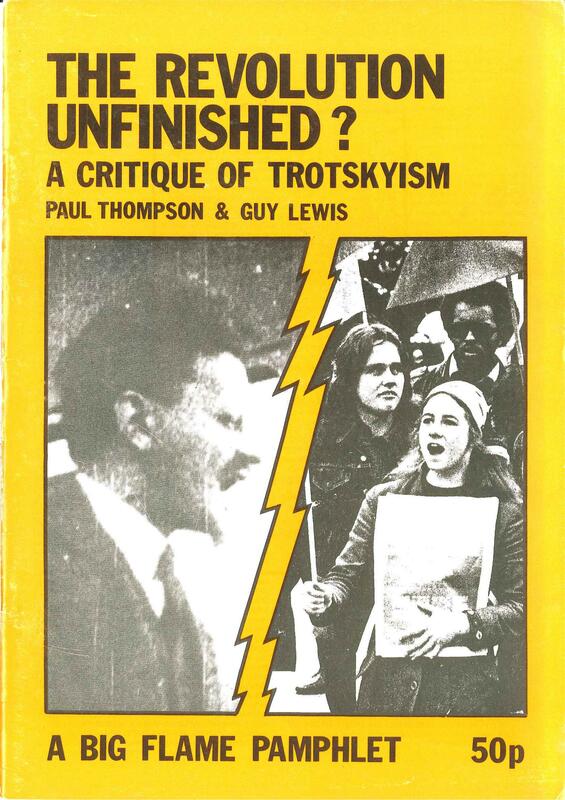 One of its most popular pamphlets was published in 1977, entitled The Revolution Unfinished? A Critique of Trotskyism. In August 1974 two BF members produced “Trotsky and Trotskyism: A Critique” for the Merseyside Big Flame educational programme. Around 1975 one of them produced another document “Class and Party in Trotskyism and Leninism”, originally intended as an article for Big Flame Journal. The two documents together can be seen as an early draft of the pamphlet. The first covered the same ground as sections 2 to 4 of The Revolution Unfinished? – the period between 1917 and 1960. The second discussed some key aspects of section 5 – the analysis of modern Trotskyism. The former is rather too long to be included here. However for purposes of comparison, this is the latter: Class and Party in Trotskyism and Leninism. For reasons I am unaware of there was a long period of gestation between these documents of 1974-75 and the publication of the pamphlet in 1977. This was written by one of the authors of the earlier documents and a new collaborator, and was the first BF publication to carry the names of individuals on the cover rather than the previous anonymity. Perhaps this was to signal that it was a discussion document, and that not all the positions taken within it were agreed by BF. However, as far as I am aware, there wasn’t much internal disagreement (with one exception mentioned below) to the positions set out in The Revolution Unfinished?. The arguments developed in the pamphlet cannot be summarised easily in a single paragraph. A few of the main criticisms of Trotskyism are its overemphasis on leadership and the elevation of consciousness above the conditions of struggle, a tendency towards the timeless application of abstract principles, the failure to give sufficient recognition to post World War 2 changes in capitalism, an obsession with bureaucracy e.g. in the emphasis on replacing bureaucratic leaders, and a simplistic view of the transition to socialism (something linear and uninterrupted). The pamphlet contains the strongest pro-Chinese Cultural Revolution sentiments (albeit with some criticisms of developments in the country) to be found in any BF publication. It was this aspect of the pamphlet with which there was the most noticeable disagreement within Big Flame. The organisation, including the authors, was soon to take a more critical position in relation to China (for a discussion of BF debates on China see Episode 7). The discussion of the Labour Party (a vehement rejection of entryism) is also interesting in light of the subsequent political trajectory of the authors, and of others who helped them with the pamphlet. Unlike many other political groups, Big Flame rarely used its publications to make explicit critiques of other groupings. The Revolution Unfinished? is the major exception, and here there was no in depth discussion of any contemporary organisation in Britain. Quotations are assembled from a variety of groups to illustrate general arguments about Trotskyism (although the last two pages do contain a diagrammatic family tree of British Trotskyist groups and a Glossary of the groups, with a few sentences on each). If you look at BF’s internal publications, you find more of a discussion of other left groups. 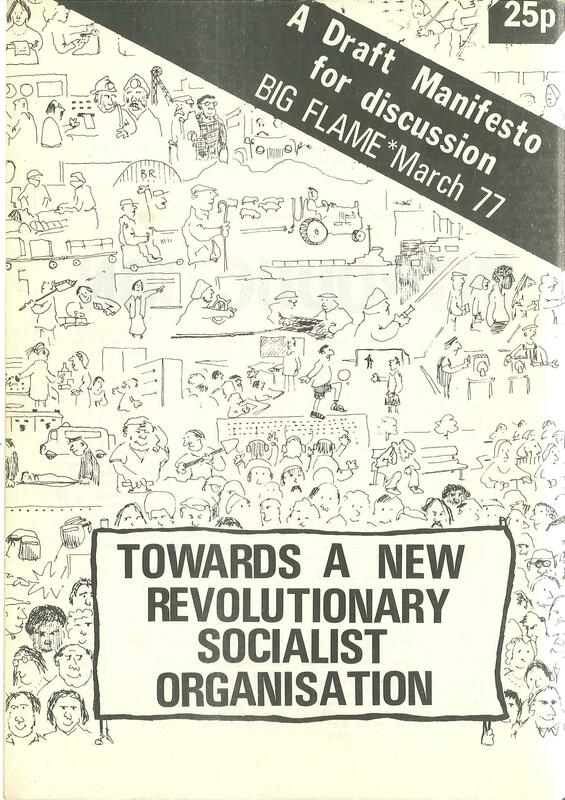 “Towards a New Revolutionary Organisation” produced for an Open Conference of the Project (see Episode 11), contains a section on ‘The State of the Left’ with paragraphs on the Communist Party, Socialist Workers Party (SWP) and International Marxist Group” (IMG). While there are positive comments about the IMG (its initiatives have been “open and principled”) the differences “remain quite strong” and the conclusion is “we don’t see the IMG as a whole as part of the same potential political tendency as ourselves”. Discussion of the IMG came to the fore as it invited Big Flame to participate in Socialist Unity – the standing of election candidates under a cross group platform. BF agreed, unlike a subsequent offer to participate in its newspaper Socialist Challenge. This article in the Internal Bulletin March 1978 was a contribution to the debate within BF: On the IMG’s Concept of the Vanguard and Ours. It argued that there were significant differences between the two concepts – BF’s concept was broader, and it saw the function of a newspaper as a tool for the vanguard to use in its political work, rather than an educator of the vanguard. The IMG and ISA (the International Socialist Alliance) – a grouping of former members of the SWP [see post on ISA] – next approach BF with a proposal that the three organisations should work towards regroupment. 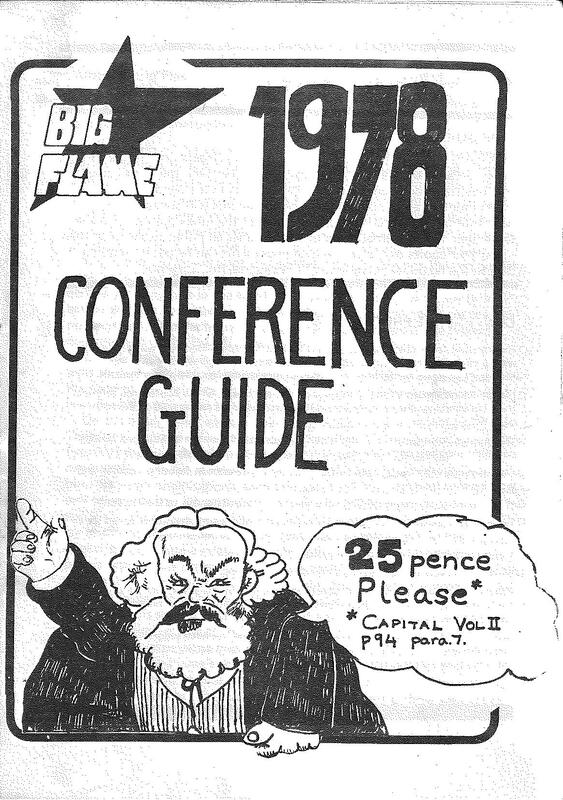 The October 1978 Discussion Bulletin contained an article “Has Big Flame got a Future?”. This argued that while BF contained many “infantile opinions” about the IMG, the latter did exhibit “programme fetishism” and a tendency towards “caucus style politics”. Only one voice was raised in favour of the unity proposal, in an article in the next Discussion Bulletin November 1978 “For a Regroupment Project with the IMG/ISA”. At the December 1978 there was a vote at the BF National Committee on whether or not to sign an appeal from the IMG and ISA on joint work as a move towards regroupment. Only the author of the last mentioned document voted in favour. The other 9 persons present voted against. The vote was influenced by a strong reaction amongst the BF membership against the idea of fusion with the IMG. The Revolution Unfinished? uses the term “state collectivism” in relation to the Soviet Union and Eastern Europe. This pamphlet led on to another one from Big Flame. About “soviet type societies”, it was called The Century of the Unexpected. This will be discussed in the next episode of this series.